It is common to experience cough after eating as it may happen because of various reasons. Coughing occurs when the body is trying to get rid of the irritants in the airways. Such irritants may enter the airways with food or air to cause allergic reactions in response. What Causes Cough After Eating? Frequent coughing should be diagnosed to determine the cause for it. However the most common causes are listed below. Certain foods are not accepted by the body as if overreacts to the irritants contained thinking of them as harmful substances. Although food allergies develop early in the childhood, they may till occur anytime in your lifespan. A food allergy may also cause other symptoms like wheezing, shortness of breath, or a runny nose. 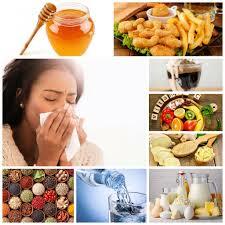 The foods known to cause most allergies include milk based products, soy, peanuts, tree nuts, eggs, and shellfish. Only a doctor may help to determine the cause and type of food allergy based on the symptoms. Asthma is often linked with food allergies as it is triggered with certain foods as well. For example, foods containing sulfite cause asthma symptoms and should be avoided in such a case. Such foods include beer, wine, soft drinks, dried fruits, and pickled onions. Asthma may cause other symptoms like wheezing, breathing problems, and tightness in the chest. The respiratory system can suffer from an infection which causes cough as a symptom. This type of cough tends to irritate the throat continuously without letting it to heal. This makes it difficult to treat as the throat may become inflamed. It is important to treat the infection in order to stop cough as it will further create discomfort. Dysphagia is a condition when there is difficulty in swallowing food. It feels like food is stuck in the throat as the stomach takes ling time to move food into the stomach. Acid reflux and GERD can be a cause of dysphagia although it is better to consult a doctor to know the right treatment. Acid reflux is the travelling of acid from the stomach towards the throat which creates discomfort in the chest. The acid then irritates the food pipe to cause bitter taste sore throat and burning sensation. Frequent acid reflux occur when there is condition known as gastroesophageal reflux disease which also causes excess stomach gas. A doctor will be able to treat these conditions with medications and also making dietary changes. This happens when food particles enter your throat to cause irritation. However, healthy lungs throw out any such food that has entered through the wrong hole, the condition may get worse if this doesn’t happen. There is usually no need to visit a doctor if a person experiences mild cough after eating occasionally. However, if cough continues for more than 2 weeks or occurs frequently without any known cause, it is necessary to consult a doctor to examine for underlying cause. Coughing should not worsen as it will inflame the throat badly and create more problems in future. Cough can be prevented by avoiding foods that are known to trigger coughing. Furthermore, certain precautions should be taken to prevent worsening cough after eating or drinking that are listed below. Are Digital Pregnancy Tests More Accurate?